Arum is a genus of flowering plants in the family Araceae, native to Europe, northern Africa, and western and central Asia, with the highest species diversity in the Mediterranean region. Frequently called “Arum Lilies”, they are not closely related to the true lilies. 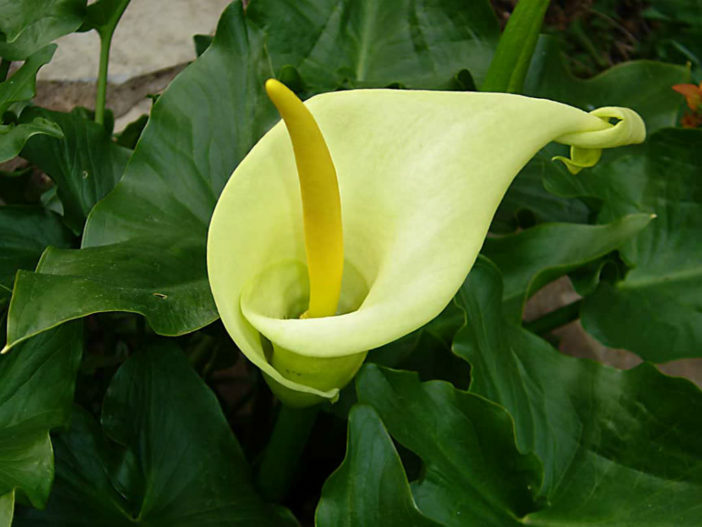 Plants in closely related Zantedeschia are also called “Arum Lilies”. Arums are rhizomatous, herbaceous, perennial plants growing 8 to 24 inches (20 to 60 cm) tall, with arrowhead-shaped leaves 4 to 22 inches (10 to 55 cm) long. The flowers are produced in a spadix, surrounded by a 4 to 16 inches (10 to 40-cm) long, colored spathe, which may be white, yellow, brown, or purple. Some species are scented, others not. The fruit is a cluster of bright orange or red berries. Most gardeners know at least one Arum, probably Arum italicum. This charming woodland plant can be bought cheaply in garden centers and nurseries as either a bulb or a growing plant. From small and cute to huge and chunky, foul stench to delicate aroma, Arum has it all! It is only a shame that many need the care of a greenhouse, but in a sheltered position it is possible that many many species may survive. Considering the rarity of many species it is best to bulk up your plants in the greenhouse and only try them outside if you have spare tubers. Arums are quite easy to grow. The shade or part shade species need a moist but free draining soil. Their biggest threat comes from drought. However most species are sun lovers and are grown on what is known as a “Mediterranean Cycle”, that is a warm and dry summer and a cool and wet winter. The most important thing with this latter group is drainage. Drainage should be very sharp as they will not tolerate sitting in water at all. When potting up tuberous aroids, use a pot three times the diameter of the tuber.